Virgin Media has decided not to stand in the way of subscribers who want to leave its cable TV service. 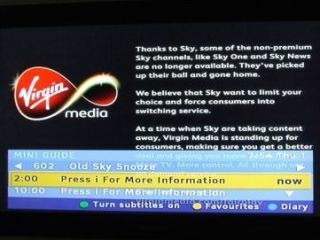 This follows the removal of TV channels provided by Sky after talks between the two companies broke down. In a statement, issued this morning, Virgin Media CEO Steve Burch said: "Virgin Media wants to do the right thing by its customers and resolve this dispute, as well as its underlying causes." "We think our customers will quickly recognise that the improvements we've recently made to our TV service, together with other exciting enhancements we've got in the pipeline, make Virgin Media's TV service the most comprehensive and exciting in the UK." "Over the next month, however, if they don't agree, we will not use technical legalities to stand in the way of them switching to another service." The company said it had been greeted with a ground swell of support in its dispute with Sky, which centres on pricing for basic Sky TV channels - like Sky One - which were previously available on Virgin Media. Virgin Media also welcomed an announcement from the National Consumer Council ( NCC ), that expressed concern over the availability of basic Sky TV channels. "We strongly agree with the NCC - there are flaws in the UK pay TV market which are harming the interests of consumers and an investigation is warranted. As we have said repeatedly this week, anything that will shed daylight on these problems and our recent dispute with Sky is welcomed by us."